How porosity affects your cylinder. It is a common question we receive, "Why does my cylinder have pits in it?" The best answer is that it is porosity. Unfortunately there are a lot of misconceptions about porosity. Some of which include that a ring will catch on it or that it will cause poor ring seal. This is typically not the case. Kept in proper ranges rings will not be negatively affected by porosity. The holes fill up with oil creating a better ring seal and lowering the coefficient of friction. Some of the leaders in honing have gone so far as putting "porosity" in the bore to achieve this.A link to their website is here. We have done extensive testing and have never seen the effects of porosity on a blow by meter or had a coating failure attributed to porosity. To understand porosity you have to understand what it is. Simply it is trapped gas bubbles from when the aluminum was poured. Most foundries have technologies that reduce this porosity but as a rule the deeper you go in a casting the more porosity you will find. That is why big bores are more susceptible to porosity than stock replates. Welding can also introduce porosity. As a rule, everything is done to eliminate it but, depending on the material or its age, it may not be possible. Another question is why does it have porosity on it now when it didn’t before? There are two reasons for this. Our plating process chemically removes material to allow the plating process to work. 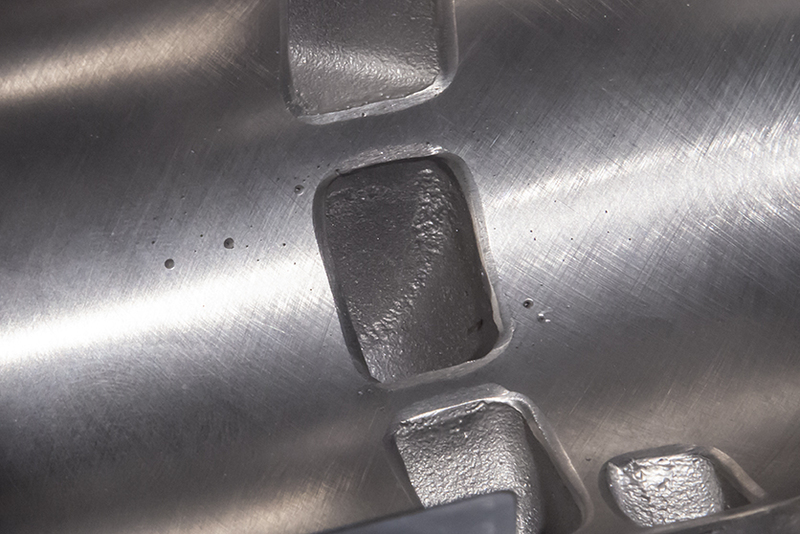 That etching exposes new porosity just under the machined surface of the bore. Our plating fills in most of the porosity but some of the bigger pits may be leftover. Machining tends to hide the surface porosity because it not only cuts the aluminum but also smears it into the surface. The other reasons can be found above, that either we may have needed to do some welding or boring which exposed new porosity. The most important factor about porosity is why worry about it in the first place. Every OEM has a specification on allowable porosity and we would never send a cylinder out that would not pass this spec. If we would have a cylinder bore beyond this spec you will receive a call from us before shipping to discuss.